the site houses both the winery and visitors centre, along with a guest house. 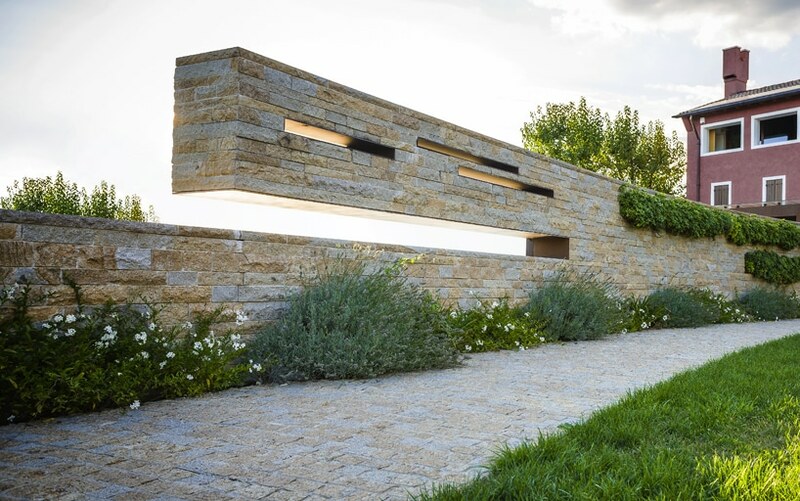 the focus of the winery garden project was to create a space that played with the balance between public and private areas whilst creating a controlled journey for the visitor. the surrounding fence is constructed of flat corten steel pieces arranged vertically. 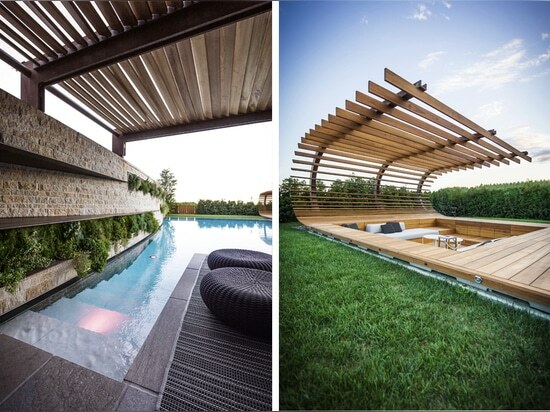 the width and the rotation of each individual piece allow control of the visual permeability of the garden. visitors will be lead from the wine tasting room to where the pathway splits: left to the main garden, and right to the winery building. following the leftmost path they are brought around the main entrance, with a large corten steel plaque inscribed with musings on wine from various poets. through the entrance, the pathway continues up towards the main building, where a low wall oversees the private garden. 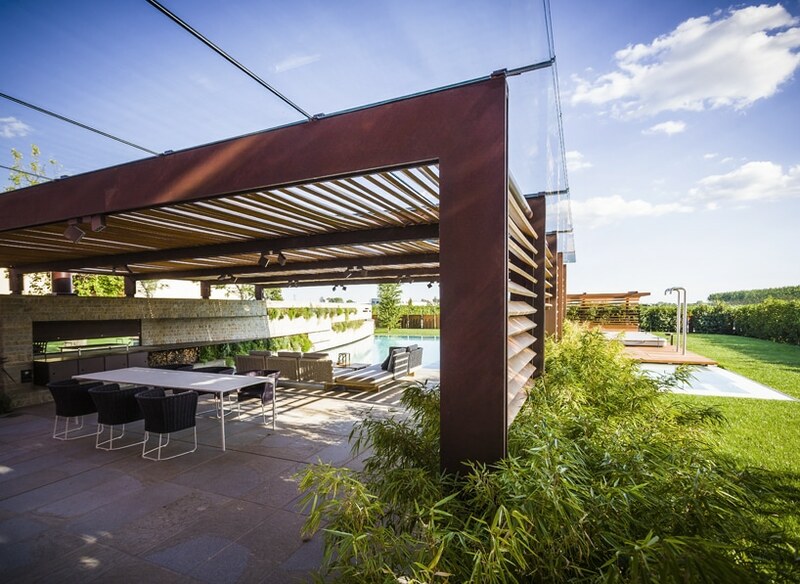 further along, this wall suddenly cantilevers and increases to full height in order to block the view to the swimming pool, showers and seating areas of the private space. this combined with other walls, obstruct the view to the private yard from the winery building. 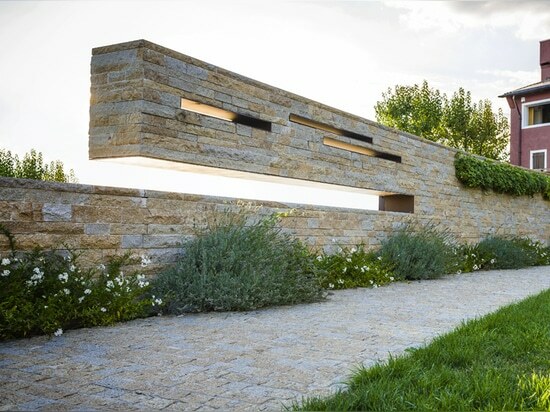 cleverly position slots on the stone allow glimpses of the water and play with horizontal stripes of the vertical garden. 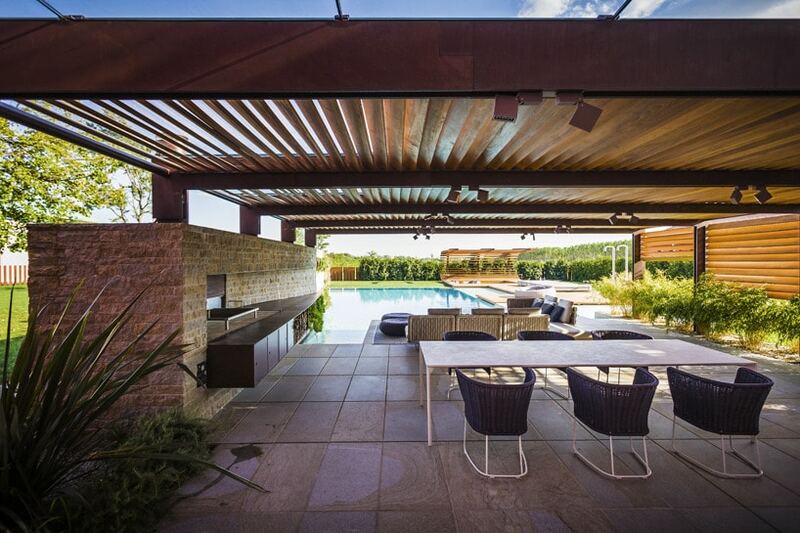 these sequences of horizontal indications culminate with a glass opening that allows views to the barbecue on the opposite part. 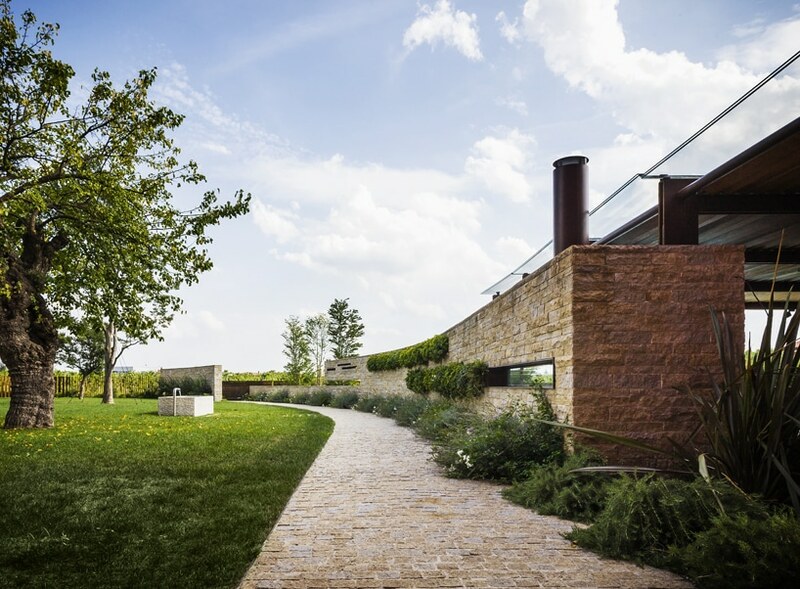 within the private space, intended for use by guests, this wall stretches along the whole garden, culminating in a log storage area where it meets the building at the top end. 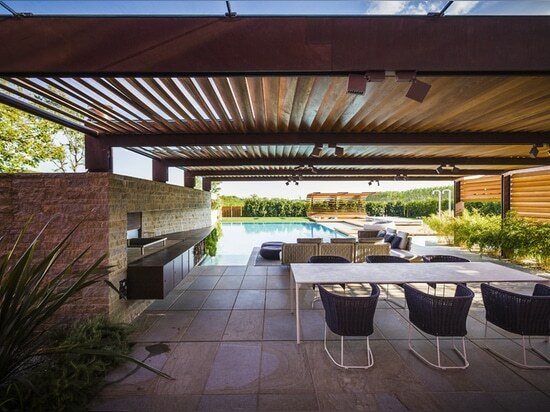 here glass and timber shades reach over the seating area, for the space to be used even during the hottest times of the day. the pool is divided by stone steps that sit just above the level of the water, into two separate sections: one side is a shallow bathing hydro massage, while on the other side you can find the larger swimming pool that has an automated cover. teak timber flooring follows on from the stone steps down the length of the private garden, culminating in a seating area. 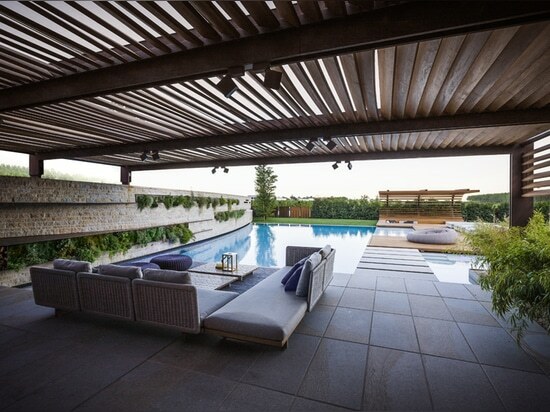 at the far end of the yard this timber surface seems to fold back on itself, raising up on curved steel beams and becoming a shade for the sunken seating below. 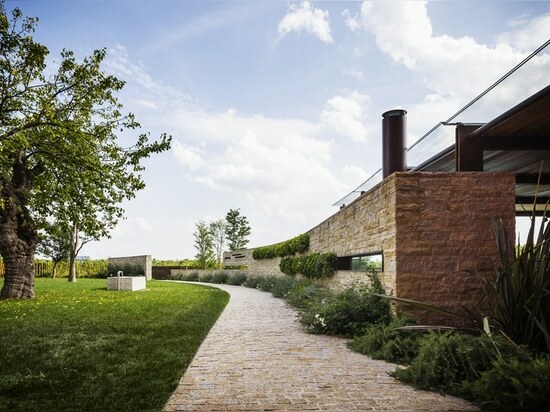 the overall result is a garden that is at one with its surroundings and offers visitors a beautifully considered environment that they feel welcome to journey through, whilst ensuring that the residents and guests have a private space to relax within.